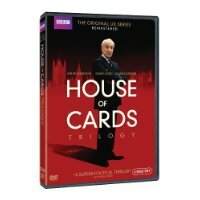 Check out the Amazon deal of the day on House of Cards (the original UK BBC version). Today only, you can save up to 77% off on select BBC series from Amazon. This sale also includes DVD and Blu Ray collections of popular shows such as “Lark Rise to Candleford,” “Monarch of the Glen,” and “‘Allo ‘Allo!” There are plenty of other UK television box sets to check out in this deal today. Also, today marks the kickoff for the lightning deals on Amazon’s site in preparation of Black Friday.